Place potatoes and water in a microwave safe bowl. Cook potatoes in microwave on high until just tender, about 15 minutes, stirring half-way through. Drain potatoes and allow to steam for a few minutes to dry. In a large bowl, stir together mayonnaise, wine, rosemary, and garlic powder. Mix in drained potatoes and toss to coat. Marinate, covered, in the refrigerator for 1 hour. Remove potatoes from marinade, and skewer. Grill, covered, for 6 to 8 minutes, brushing occasionally with marinade, turning half-way through. 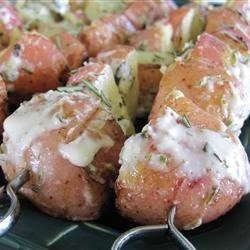 Remove potatoes from skewers and serve hot.